In early November 2018, the GR hosted two events in its own organisation at once: the 29th Ambient Ljubljana – Furniture Fair and the 3rd International Home Fair with 33,000 visitors in 5 days. Next year it will be all about celebration. GR – Ljubljana Exhibition and Convention Centre ran at once two fairs under the same roof and with a common slogan »Everything for your Home!« – the Ambient Ljubljana and the fall edition of the famous fair Home Plus. Both of the fairs were welcoming Slovenian and foreign visitors between the 7th and the 11th of November 2018. On top of hosting many major international events, the GR – Ljubljana Exhibition and Convention Centre (GR) offers a professional production of its own; the two fairs, a great example of GR’s simultaneous organisation and hosting, are well renowned in Slovenia and abroad. Ambient Ljubljana Fair presents the offer of furniture and interior design, while the Home Plus Fair exhibits woodwork, heating and cooling engineering, prefabricated houses, security, and landscaping. This year, the offer of 234 companies from 19 different countries was on display for five days for more than 33,300 visitors. Along the usual exhibitions, there were many other programmes organised as well. This year’s design award Top of the Top that is given to the best among the chosen TOP 5 went to 3S design company and its Oblique magnet designed by Lana Strle, Kaja Strle, and Maca Strle. Pirnar for an entrance wall Theatrica designed by Roman Pirnar and Ernest Bevc. Donar for chair Nico Less W1 designed by Primož Jeza Studio. Pohištvo Potočnik, Aleš Potočnik for its kitchen NUT designed by Julijan Krapež, Saša Barakovič and Aleš Potočnik. Žurbi Team for its Ping Pong Table designed by Rok Žurbi. TOP Ideas, the 9th exhibtion and trade show of the young still un-established architects and designers puts at the forefront their creativity and innovation. The TOP Ideas is the only such event in Slovenia that successfully promotes the creativity of young people and contributes to their entry into the market. GR presented 24 selected individuals, groups, or newly established entrepreneurs. This year’s special guest of Ambient was Twils S.r., a family company from Italy with more than 20 years of experience with sophisticated craftwork or sewing of upholstered beds, accessories and bedding. 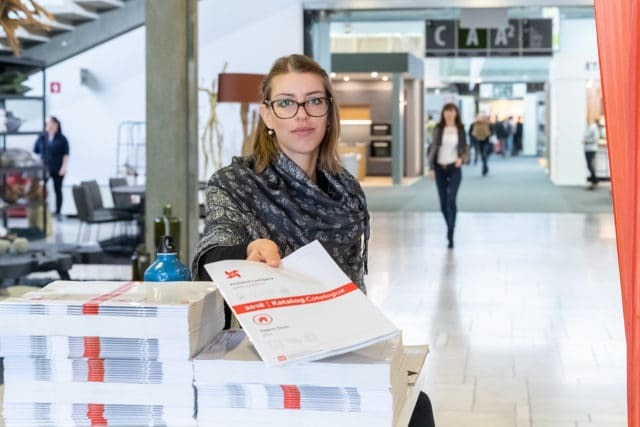 Every day, visitors were able to get free advice from independent experts from the Building and Civil Engineering Institute and the ENSVET net of Eco Fund – Slovenian Environmental Public Fund, as well as free architectural advice. In 2019, the fairs will be even more special for there will be two birthdays at once! The GR – Ljubljana Exhibition and Convention Centre will celebrate its amazing 65th anniversary, while the Ambient Fair its 30th!